New Delhi: After decades in operation, four colleges affiliated to the University of Delhi approached a commission under the human resource development ministry in August—all seeking minority status. The colleges, run by the Delhi Sikh Gurdwara Management Committee and some dating as far back as 1951, had never felt the need, or sought, the designation until now. Then came the Supreme Court’s landmark decision in April approving reservations in educational institutions for students of other backward classes, or OBCs. The law calls for 27% of seats to be set aside for OBCs in all institutions of higher education run by the government, but leaves out so-called minority status institutions. A minority status has thus become the loophole in terms of having to set aside a significant portion of seats for OBCs. The minority status exempts the institutions from implementing all quotas—even those for scheduled castes and scheduled tribes—and gives the institutions, and the trusts that often run them, the freedom to formulate their own admission policy and related rules. As a result, the quasi-judicial National Commission for Minority Educational Institutions has been flooded with similar applications—some 600 so far this year. “This has happened because a large number of these institutions want to escape the government’s provision for reservations," concedes one senior official of the commission who didn’t want to be named. “OBC quotas take up a significant number of seats and since minority institutions are exempt from the reservation policy, a minority status is the only way out for institutions who want to escape the quotas." To qualify for minority status, an institution must be established and run by a religious minority—defined as Muslims, Christians, Sikhs, Buddhists, and Zoroastrians. Under commission rules, it must admit minority students under a “prescribed percentage governing admissions". But no rules governing this percentage actually exist. Until the extension of quotas to OBCs, many of these institutions voluntarily practised a combination of general admissions, SC/ST quotas and favoured admissions for their own communities—such as the Delhi colleges run by the Sikhs. 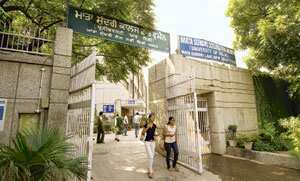 “Our colleges observe every Delhi University norm whether it is with respect to teachers’ appointments or admissions. However, they do give preference to Sikh students by way of relaxation in marks at the time of admission," said Harvinder Singh, general secretary of the Delhi Sikh Gurdwara Management Committee. “We, as institutions, should have the power in our hands to decide on our admission policy so that we can admit more students from our own community. That’s why we need the minority status for our colleges." Delhi University is challenging the committee’s request for minority status. The committee refused to disclose the make-up of its student population by religion or other factors. The commission is also seeing a flurry of litigation from colleges seeking status with many having been denied by state governments. From 373 cases in 2005, the commission registered 2,085 cases in 2006 though it went down to 1,104 in 2007. Through mid-September, the commission has already registered 961 cases. Commission officials point out that a sizeable number of these new cases are from Kerala, which has seen a fight between the state and its growing number of private professional colleges. In an effort to regulate the colleges, the state passed a law in 2006 that is being challenged in the Supreme Court. Now, the same institutions are trying to use minority status as a way to gain more control. “Many institutions from the state who were denied minority status by the state government approached the (commission) for the same," said Romy Chacko, who has been the counsel in about 150 cases. The other states with large number of cases include Tamil Nadu and Andhra Pradesh, where state governments were quick to announce reservations for certain categories soon after the Indian government’s decision to implement OBC quotas. These state government actions were largely seen as a strategy to win over communities viewed as potential vote banks. In March 2007, the AP legislative assembly passed a resolution urging the government to take all steps necessary for the implementation of the OBC quota, followed by the Tamil Nadu government announcing a 7% quota for Muslims and Christians in education and employment. More recently, the Rajasthan government announced a 5% quota for Gujjars under a “special, separate backward class" category in education and employment, putting an end to violent agitations by the community in June. The “immediate trigger therefore is the OBC quota Act", says Chacko. “Tomorrow, if the Central government or the state legislature enacts a law for state educational institutions, minority institutions will be exempt from it. The last recourse for these institutions is a minority status." Notably, state governments have been reluctant in granting minority status to educational institutions. This reluctance led to provisions by the commission to grant state institutions such status only after an appeal. Al Iqra Teachers’ Training College in Muslim-dominated Bario town in Dhanbad, affiliated to the Vinoba Bhave University in Jharkhand’s Hazaribagh district, is one example. “We waited for the Jharkhand government to grant us minority status for three years but our application got mired in bureaucratic red tape," said Shamim Ahmad, principal of the college, which reserves 50% of its seats under management quota. Besides getting around quotas in admission, Al Iqra also wants more control over its fee structure. “We even proposed a need-based fee structure to the government but they kept finding fault with it. As a result, we are surviving as a self-financed college and I admit, struggling with finances," Ahmad says. In January, the college was granted minority status. This allows Al Iqra access to funds from more sources—and admit whomever it wants.